Alie-Cox hauled in seven of his 13 targets for 133 yards and two touchdowns in nine regular-season games in 2018. Analysis: Alie-Cox saw most of his offensive workload only after Jack Doyle (hip) landed on injured reserve in Week 12. Even then, the 25-year-old was mostly used as a blocker behind top tight end Eric Ebron. 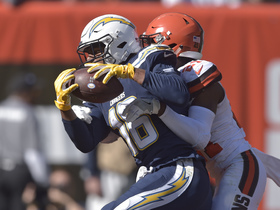 Alie-Cox has one year remaining on his contract, and appears likely to return to Indianapolis in a reserve role in 2019. 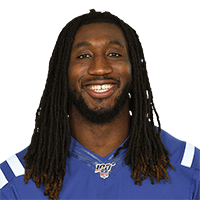 Alie-Cox had no catches while only being targeted once despite playing in 32 offensive snaps in Sunday's win over the Giants, Andrew Walker of the Colts' official site reports. Analysis: Alie-Cox hasn't produced much fantasy value since he hauled in a couple touchdowns midseason. The most notable part of his game Sunday was that he played a significant portion of the offensive snaps once Eric Ebron (concussion) exited. Alie-Cox was used primarily as a blocker, but he could see a slight fantasy uptick if he can garner some more targets when on the field. If Ebron is unable to return for Week 17, look for Alie-Cox to again see a larger role on offense. 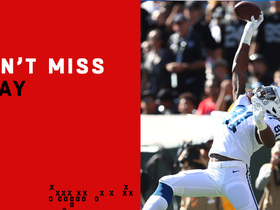 Alie-Cox failed to catch his lone target in Sunday's 23-0 win over the Cowboys. Analysis: Alie-Cox returned after missing the previous three games and led Colts' tight ends by playing 40 of 72 offensive snaps. The 25-year-old outsnapped starter Eric Ebron 40-38, but with the team bleeding the clock with the run game in the second half, it's hardly an indication of changing roles. Alie-Cox appears entrenched as the Indianapolis' No. 2 tight end, although he holds little fantasy value in the low-volume role. Alie-Cox (calf) no longer has an injury designation and will play Sunday versus the Cowboys. Analysis: Alie-Cox sat out the last three games but will gear up for his Week 15 return. The 25-year-old has six catches for 112 yards and two touchdowns this year and will slot in as the No. 2 tight end behind Eric Ebron. He's a low-volume player, but the Colts use tight ends enough in the red zone that he could be good for a score. Alie-Cox (calf) returned to practice Wednesday, Andrew Walker of the team's official site reports. Analysis: Alie-Cox has been coming into his own prior to sustaining a calf injury back in Week 12. Having missed consecutive weeks, it's tough to predict whether the rookie will be held to a snap limit during Sunday's game. As for now, a return to the practice field is a step in the right direction. Alie-Cox (calf) was ruled out for Sunday's game at Houston, Mike Chappell of Fox 59 News Indianapolis reports. Analysis: Alie-Cox has been battling the calf injury for the last few weeks and will miss his third straight game. Eric Ebron (illness) and Erik Swoope (knee) have also faced injury issues this week, leaving the Colts dangerously thin at tight end. Alie-Cox (calf) will not practice Wednesday, Kevin Bowen of 1070 The Fan Indianapolis reports. Analysis: Alie-Cox has sat out in the Colts' last two games. Last week, Alie-Cox was spotted with a protective boot over his calf. His practice status later this week will paint a better picture as to whether he'll play Sunday, but he should still be considered questionable at the least for now. Alie-Cox (calf) was ruled out for Sunday's Week 13 game against the Jaguars, Mike Wells of ESPN.com reports. Analysis: Alie-Cox sat out Week 12 and was still wearing a protective boot over his left calf as recently as Wednesday, so him being ruled out isn't surprising. The Colts' tight ends are in rough shape -- Jack Doyle (kidney) out for the season, while Erik Swoope is also nursing a knee injury. Alie-Cox (calf) won't participate in practice Wednesday, Zak Keefer of The Indianapolis Star reports. Analysis: Alie-Cox is still donning a boot on his left calf and seems to be trending toward sitting out Sunday's game against the Jaguars. Once healthy, Alie-Cox could slot in second or third on the depth chart behind starter Eric Ebron after the Colts ruled Jack Doyle (kidney) out for the season earlier this week. Alie-Cox has hauled in only six of 11 targets across six games but has turned those receptions into 112 yards and two scores. Alie-Cox (calf) was ruled out for Sunday's matchup with the Dolphins, Zak Keefer of The Indianapolis Star reports. Analysis: Alie-Cox was originally deemed questionable for the Week 12 contest. This leaves the Colts with only two tight ends for Sunday -- Jack Doyle and Eric Ebron -- as Erik Swoope (knee) is also out. Alie-Cox (calf) didn't practice Friday and is listed as questionable for Sunday's game against the Dolphins. 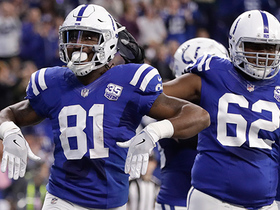 Analysis: Depth at tight end could be a concern for the Colts on Sunday, as Erik Swoope (knee) has already been ruled out. The fact that Alie-Cox was unable to practice Friday casts serious doubt on his availability for Week 12. If Alie-Cox is unable to go, Jack Doyle and Eric Ebron would be the only healthy tight ends currently on the roster for the Colts. Alie-Cox (calf) was a limited participant in Thursday's practice, Andrew Walker of the Colts' official site reports. Analysis: Alie-Cox was a surprise addition to Thursday's injury report after practicing without issue to begin the week. The 25-year-old is nursing what appears to be a minor calf injury, but there isn't currently any reason to believe that his status for Sunday's game against the Dolphins is in danger. With Erik Swoope (knee) still managing a knee issue, Alie-Cox could serve as Indianapolis' No. 3 tight end if he's able to suit up. Alie-Cox had two receptions for 28 yards on four targets in Sunday's win over Jacksonville. However, he did have a drop that led to an interception. 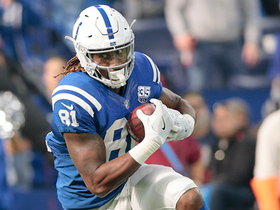 Analysis: Alie-Cox continues to have a role in the passing game even with Jack Doyle returning from injury the past two weeks as Indy has spread the ball around. Alie-Cox played 23 snaps on offense and went out for a pass on seven plays, according to Pro Football Focus. 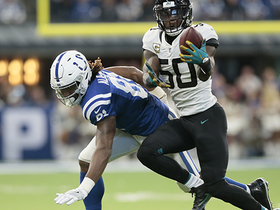 Jacksonville Jaguars linebacker Telvin Smith intercepts Indianapolis Colts quarterback Andrew Luck pass intended to tight end Mo Alie-Cox. Indianapolis Colts tight end Mo Alie-Cox reaches high down the middle for a 27-yard gain against the Jacksonville Jaguars. 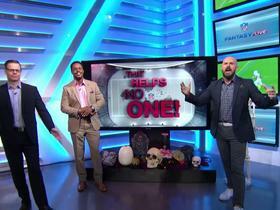 NFL Networks' analyst break down the top plays of Week 8 that helped nobody in fantasy but were crucial during the game. 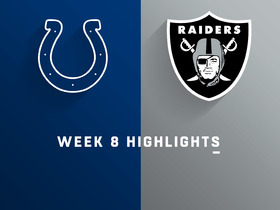 Watch game highlights between the Indianapolis Colts vs. Oakland Raiders in Week 8 of the 2018 season. Indianapolis Colts tight end Mo Alie-Cox uses his basketball skills to pull down one-handed touchdown.